Italy: Benito Mussolini, a key figure in the creation of Fascism, bullies the King of Italy into making him Prime Minister after threatening to march to Rome and defy his authority, which could have plunged Italy into civil war. Benito Mussolini was one of the founders of the Fascist Movement in Italy and the leader of the National Fascist Party. He was a powerful and merciless leader. When he threatened to march to Rome and defy the authority of the king, in order to avoid plunging Italy into a civil war, the king of Italy declared Benito Mussolini as the Prime Minister of Italy on 28 Oct 22. As a socialist, Mussolini had initially opposed Italy's entry into World War One, but changed his mind as he pondered Marx's notion that social revolution follows war. 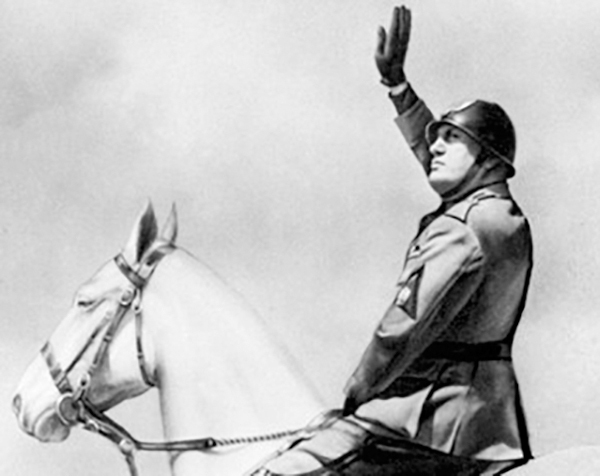 After WWI, Mussolini became a dedicated anti-socialist, convinced a dictator was needed to solve Italy's problems. He intended that man to be him. At 39 years of age, Mussolini became the youngest Prime Minister in Italian history, and he secured the powers of a dictator within a year, using it to secure the Fascists in parliament. Although the king remained notionally in charge and the fascists didn't have a broad base of support, Italy was turned into a dictatorship. Fascist propaganda portrayed Mussolini as a superman who united the country, the man who "made the trains run on time." His greatest, if not only, political success was settling the long standing disagreement between Italy and the Pope in the Lateran Pact. However, Mussolini wanted more than a renewed Italy, he wanted an Italian empire. CBI - China: Day 41 of 154 of the Japanese Invasion of Manchuria. Spain: Day 104 of 985 of the Spanish Civil War. CBI - China: Day 9 of 29 of the 1st Battle of Suiyuan. Spain: Day 469 of 985 of the Spanish Civil War. CBI - China: Day 114 of 2,987 of the 2nd Sino-Japanese War. Day 77 of 106 of the 2nd Battle of Shanghai. Day 58 of 70 of the Battle of Taiyuan. Germany: Nazis arrest 17,000 Jews of Polish nationality living in Germany, then expels them back to Poland and refuses them entry. Spain: Day 834 of 985 of the Spanish Civil War. CBI - China: Day 479 of 2,987 of the 2nd Sino-Japanese War. Day 17 of 81 of Japan's Operation GUANGDONG. Czechoslovakia: Czech students stage a large demonstration in Prague against Nazi occupation which turns violent, resulting in the martyrdom of Czech student leader Jan Opletal. CBI - China: Day 844 of 2,987 of the 2nd Sino-Japanese War. ETO - UK: Day 53 of 258 of the Blitz. ETO - UK: Day 111 of 114 of the Battle of Britain. MTO - Greece: Italy attacks Greece from Albania after the Greeks reject a three-hour ultimatum. MTO - Italy: Hitler and Mussolini meet in Florence to discuss Italy's invasion of Greece. It is the sixth of their fourteen meetings. East Africa: Day 141 of 537 of Italy's East African campaign in the lands south of Egypt. CBI - China: Day 1,210 of 2,987 of the 2nd Sino-Japanese War. Day 349 of 381 of the Battle of South Guangxi. CBI - Thailand: Day 28 of 221 of the Franco-Thai War (Vichy France vs Thailand). Russian Front - Finland: Day 122 of 142 of Operation SILVER FOX, a joint German-Finnish campaign to capture the Russian port of Murmansk in the Arctic. Russian Front - Finland: Day 120 of 140 of Operation ARCTIC FOX, a joint German-Finnish campaign against Soviet Northern Front defenses at Salla, Finland. Russian Front - Finland: Day 129 of 164 of the Battle of Hanko. The Soviets will be forced off their leased naval base. Russian Front: Day 129 of 167 of Germany's Operation BARBAROSSA. Russian Front - North: Day 51 of 872 of the Siege of Leningrad. Russian Front - Center: Day 27 of 98 of the Battle of Moscow. MTO - Libya: Day 202 of 256 of the Siege of Tobruk. East Africa: Day 506 of 537 of Italy's East African campaign in the lands south of Egypt. CBI - China: Day 1,575 of 2,987 of the 2nd Sino-Japanese War. USA-Canada: The Alaska Highway, or Alcan Highway, started 08 Mar 42, is completed in rough form, connecting the contiguous US to Alaska through Canada. Russian Front - North: Day 416 of 872 of the Siege of Leningrad. Russian Front - North: Day 177 of 658 of the Siege of the Kholm Pocket, USSR lays siege to the Kholm Pocket but the Germans hold out for a about a year and a half. Russian Front - South: Day 123 of 150 of Germany's CASE BLUE, the failed offensive to take the Caucasus oil fields. Russian Front - South: Day 67 of 165 of the Battle of Stalingrad, bloodiest battle in human history. MTO - Egypt: Day 6 of 20 of the 2nd Battle of El Alamein. US B-25s provide air support causing the Germans to cancel their counter-attack plan. MTO - Greece: US B-17s attack Axis warships in Pylos Bay. East Africa: Day 177 of 186 of the Battle of Madagascar. CBI - China: Day 1,940 of 2,987 of the 2nd Sino-Japanese War. PTO - Alaska: Day 144 of 435 of the Battle of Kiska, Aleutian Islands. The US and Canada will defeat the Japanese invaders. PTO - Malaya: Day 252 of 357 of the Battle of Timor Island, a long guerrilla war ending in Japanese victory. PTO - New Guinea: Day 100 of 119 of the Battle of the Kokoda Track. The Australians continue pushing back the Japanese troops. PTO - Solomon Islands: Day 83 of 187 of the Battle of Guadalcanal. Russian Front - North: Day 781 of 872 of the Siege of Leningrad. Russian Front - North: Day 542 of 658 of the Siege of the Kholm Pocket. USSR lays siege to the Kholm Pocket but the Germans hold out for a about a year and a half. Russian Front - South: Day 66 of 122 of the Battle of the Lower Dnieper River, USSR. MTO - Italy: US 12th Air Force A-36s hit several highways and bridges in the battle areas. CBI - China: Day 2,305 of 2,987 of the 2nd Sino-Japanese War. PTO - New Guinea: Day 40 of 219 of the Battle of Shaggy Ridge. PTO - New Guinea: Day 37 of 162 of the Battle of the Huon Peninsula. ETO - France: Day 89 of 284 of the Battle of Brittany. ETO - Belgium: Day 57 of 62 of the liberation of Belgium. ETO - Belgium: Day 27 of 38 of the Battle of the Scheldt Estuary. The Germans begin to withdraw into Walcheren Island, Netherlands, located at the mouth of the River Scheldt, on which the vital port town of Antwerp lies. ETO - France: Day 44 of 236 of the Siege of Dunkirk. ETO - Germany: Day 40 of 145 of the Battle of Hürtgen Forest. ETO - Germany: US 8th Air Force B-17s hit marshalling yards in Germany. Russian Front - Finland: Day 44 of 223 of the Lapland War. Finland and Russia have joined forces to kick the Germans out of Finland's most northern province. Russian Front - Finland: Day 22 of 23 of the Petsamo-Kirkenes Offensive. The Soviets are clearing the Germans out of the Arctic region in northern Scandinavia. Russian Front - Center: Day 14 of 206 of the Battle of the Courland Pocket in Latvia. Germans will hold this area until the very end of the war. Russian Front - Center: Day 7 of 99 of the Siege of Memel, a border town of Lithuania and East Prussia. Russian Front - Center: Day 45 of 72 of the Battle into East Prussia and northern Poland. Russian Front - Center: Day 13 of 15 of the Battle of Goldap, East Prussia. The Soviet advance into the Goldap area is brought to a standstill by the tenacious resistance of German 4th Army. Russian Front - South: Day 23 of 24 of the Battle of Debrecen, Hungary. Russian Front - South: Day 45 of 72 of the Battle of Belgrade, Yugoslavia. MTO - Albania: The Germans begin to evacuate Albania. MTO: US 15th Air Force B-17s bomb in Germany and Austria. CBI - China: Day 2,671 of 2,987 of the 2nd Sino-Japanese War. Day 195 of 259 of Japan's Operation ICHI-GO. PTO - New Guinea: Day 190 of 481 of the Battle of Western New Guinea. PTO - Palau Islands: Day 44 of 74 of the Battle of Peleliu (Operation STALEMATE II). PTO - Philippines: Day 9 of 299 of the 2nd Battle of the Philippines, aka the Liberation of the Philippines or the Philippines Campaign. PTO - Philippines: Day 9 of 73 of the Battle of Leyte. The perceptions of how victory was to be celebrated and what post-war Britain should look like were very different from the visions the people and the politicians had in 1940. Jazz was banned from German broadcasting as soon as the Nazis came to power in 1933. Yet throughout the war, American jazz and swing were core components of the Third Reich's propaganda.